With a limited arsenal of sounds, we humans can communicate a vast body of thought. Part of how we do this is by using contextual cues to distinguish between very nuanced differences in the sounds we make. This sensitivity to context has long been thought to be a uniquely human aspect of communication. But new research on sparrows suggests that some birds may be on a similar wavelength as us. When we speak we use phonemes, building blocks of sound that let us construct words with vastly different meanings. The words miss and miff vary only by their final phonemes, /s/ and /f/, but the result is two very different meanings. I wouldn’t recommend ending a letter with “you are miffed!” to your friend who just moved across the country. Although we can make a sliding scale of sounds, assigning phonemic categories to them helps us hear the difference between words. Take the phonemes /b/ and /p/. There’s a smooth gradient of sounds between them, but somewhere along the transition from one to the other we make a categorical leap. As a result, we can distinguish between words such as “abs” and “apps.” How we categorize phonemes is similar to how we assign hard boundaries to color — though the transition from blue to green is gradual, at some point, we stop calling a bluish-greenish color blue and start calling it green instead. There are also instances in which people classify identical sounds as different phonemes. Though many Americans pronounce the middle t’s in butter the same way they pronounce the final d in spread, they assign the former to the /t/ phoneme and the latter to the /d/ phoneme. Because of cases like this, our categorical perception of speech is said to be context-dependent. Many linguists, including the famed “father of modern linguistics” Noam Chomsky, have speculated that our context-dependent system of classifying phonemes arose from higher-level patterns in human speech, like syntax and semantics. But a new study from researchers at Duke University in North Carolina suggests this aspect of language may not be so human-specific after all. 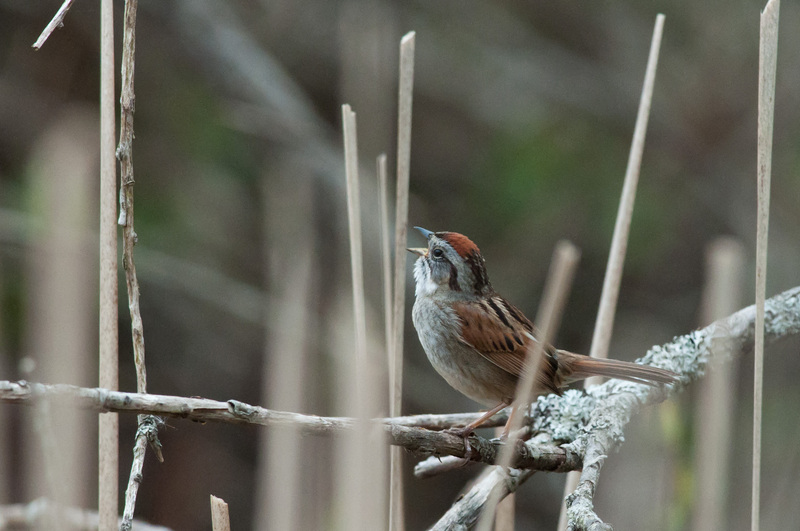 The scientists found that swamp sparrows rely on context to categorize notes in their songs, similar to how we rely on context to distinguish between phonemes. Their study strengthens the case for the theory that context-dependent categorization of sounds might actually have developed before other sophisticated machinery in our language, rather than as a result of them. In the study, published in the journal PNAS earlier this month, Lachlan and his co-author Stephen Nowicki examined the songs of more than 200 male swamp sparrows from northwestern Pennsylvania. Swamp sparrows typically sing trills that rapidly repeat one syllable again and again. Each of these syllables can then be broken up into smaller notes. When the researchers analyzed snippets of the sparrows’ songs, they found that the birds’ notes could be distributed by length into three clusters: short, intermediate and long. Short and intermediate notes, the scientists found, occurred much more frequently in the beginning of syllables, while long and intermediate notes occurred more often at the end of syllables. To determine whether the birds categorized notes differently based on context, Lachlan and Nowicki swapped out natural notes within syllables for short, intermediate and long notes that they had synthesized. The scientists would first play one modified song to a sparrow until the bird became familiarized with it. Then they would replace it with another modified song. If the bird recognized a shift in note category with the new song, it would start to furiously wave its wings — an aggressive territorial display in response to an unfamiliar signal. The researchers found that the birds did not differentiate much between short and intermediate notes in the initial position of syllables, but strongly differentiated between intermediate and long notes. Conversely, the birds did not make much of a distinction between intermediate and long notes in the final position of syllables, but made a strong distinction between short and intermediate notes. In other words, the birds’ boundaries between notes shifted depending on context. At the beginning of a syllable, the boundary between short and intermediate notes is weak, while at the end of the syllable that boundary is much stronger. The same is true for the boundary between intermediate and long notes — strong at the beginning of the syllable but weak at the end. “Identical sounds can be perceived as belonging to different underlying perceptual categories, depending on where they fall within the song,” Lachlan said. The scientists also compared the songs from the population of Pennsylvania swamp sparrows to another population from the Hudson Valley of New York. They found that while the Pennsylvania population grouped notes by length into three clusters, the New York population had two clear clusters. The findings suggest that the two populations categorize notes differently, much like how people in different geographical regions have slightly different ways of interpreting sounds. Lachlan and Nowicki also believe other populations of swamp sparrows have different categorization models. They have looked at a third population of swamp sparrows from Montezuma Marsh in the Finger Lakes region of New York, and found yet another pattern of categorizing notes there. With slightly different local conventions, swamp sparrows can distinguish between birds that belong to their group and birds that are from a foreign population — like a friend vs. foe identification scheme, said Moira Yip, a linguist at University College London in England. “These birds are responding to a ‘foreign accent,’” she said. As an illustrative example, Lachlan cited his wife, who is from Spain. “She finds it very hard to distinguish between the categories of ‘ee’ and ‘ih’ in English. So to her, sheets and shits sound the same, which is kind of a problem for her,” he joked. Scientists have shown that other animals, including chinchillas and Japanese quails, can distinguish between human phonemes — but those studies have all been done in labs, said Johan Bolhuis, a professor of cognitive neurobiology at Utrecht University in the Netherlands. “This is the first time that indications of categorical perception have been found in a natural situation, with natural sounds that the birds make themselves,” said Bolhuis, who studies the neural mechanisms of birdsong. The fact that other mammals and birds show context sensitivity when communicating “eases the explanatory burden” for the evolution of human language, Bolhuis said, since it suggests that humans were able to simply make use of an adaptation that already existed.